Plugs directly into computer printer port. Box way Z-axis assembly with ground steel plate and tapered brass gib. 1/2″ (12.7 mm) 20 pitch Cr-Mo lead screws with adjustable split bronze nuts on all axes. Mouse, 15” TFT Monitor & Keyboard. 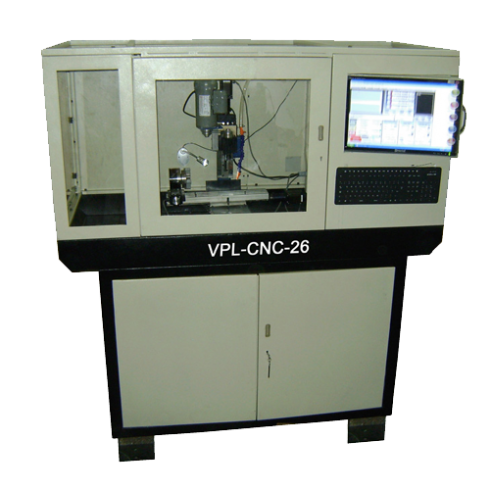 Micro Mill with New Powerful 1/4 HP spindle motor, Pulley set with drive belt, 1/8″ (3 mm) or 3/16″ (4 mm) or 1/4″ (6 mm) collet with collet closer, Electronic Chopper Driver Unit, Custom Win XP Mach 3 control software interface, 4th Axis Amplifier and Port Included, Input/Output Port Included, 200 oz-in. stepping motors, Printer cable, power cable etc. 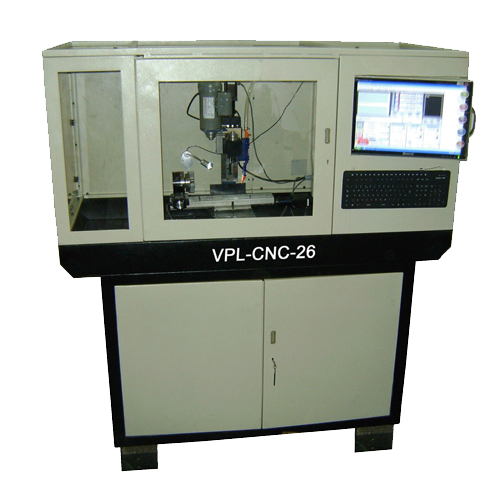 Note: VPL-CNC-26EXT (VPL-CNC-26 with 4 Axis) also available.